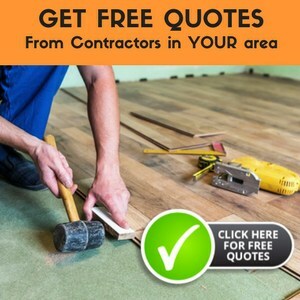 With quality laminate floors and engineered plank flooring widely available and at a lower cost than in the past, kitchen linoleum flooring seems to have disappeared from the conversation recently. However, real linoleum flooring, also referred to as “resilient flooring,” for a very good reason, is still a fantastic choice in any room, and especially the kitchen. 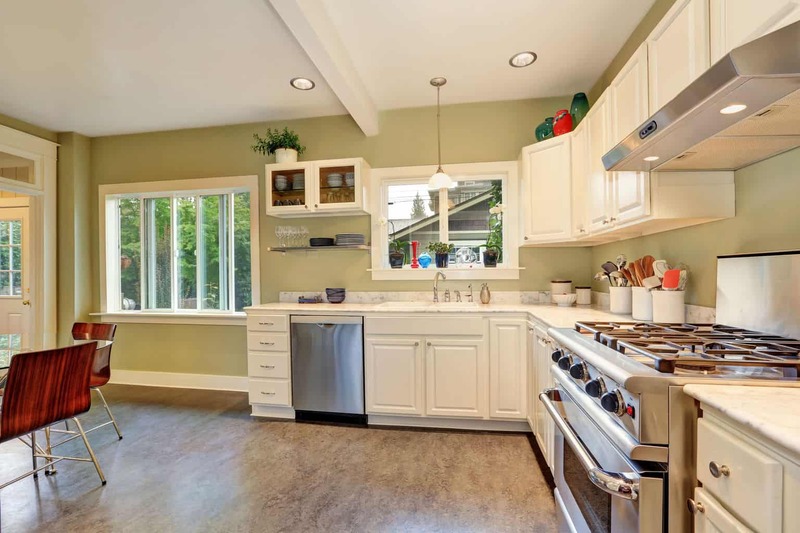 Considering Linoleum Flooring For Your Kitchen? You should! Linoleum is a vintage flooring option due for a major resurgence. The limitless design possibilities of linoleum leave potential for funky and unique styles that could make your kitchen truly one of a kind. Installing kitchen linoleum flooring is a sure way to add value to your home, as the cost is minimal and the end result is transformative! What Is Real Linoleum Exactly? Linoleum is often confused with vinyl flooring, as they can appear very similar, but the materials that make up linoleum flooring and vinyl flooring differ vastly. The base difference between the two is that while vinyl is an entirely synthetic material, linoleum is an all-natural flooring option. Linoleum is made up of linseed oil, powdered cork, resin, powdered wood, limestone, jute, and pigments. 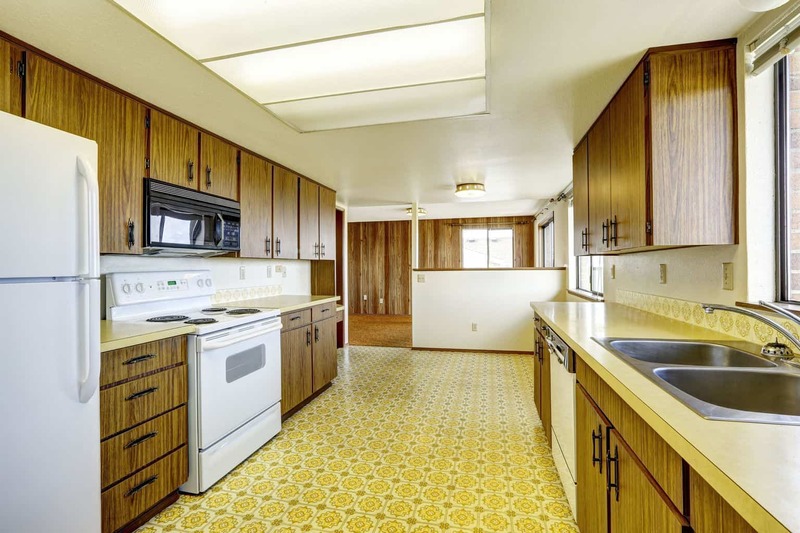 This natural material was replaced in popularity during the 1960s by vinyl, which was an even tougher substitute than linoleum that could handle stronger cleaning chemicals without damage. As PVC is a main component in vinyl flooring, however, it is controversial from an environmental standpoint. While linoleum went out of fashion originally because the look of vinyl was so much more vibrant, linoleum flooring has come a long way from a design standpoint from the Depression era linoleum flooring. These days, linoleum comes in sheets or tiles, and the range of pattern and color options are endless. Perhaps the greatest selling point for linoleum is its durability: it is water resistant, stands up to the wear and tear of heavy traffic better than almost any other flooring option. Linoleum flooring has antibacterial properties and is even static free (making sweeping up pet hair a breeze). 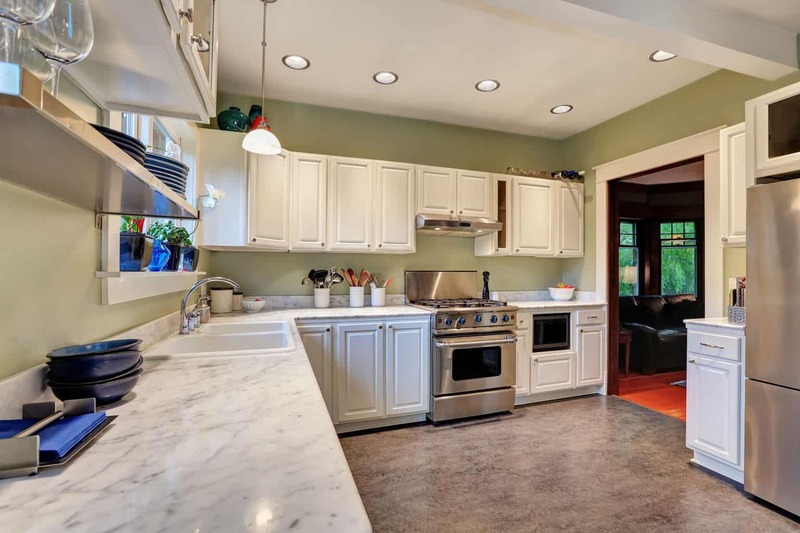 The flooring itself is comfortable and warm in comparison to other flooring options, like tile, which means standing on your linoleum kitchen floor while you’re cooking will be significantly more pleasant. This resilient flooring is a favorite of parents and pet owners alike, especially in the heart of the home, the kitchen. Additionally, linoleum is a very affordable flooring option, comparable to vinyl and a real bargain in comparison to hardwoods, coming in at approximately $2-$8 per square foot. You may be surprised to find that linoleum is actually a favorite among the eco-friendly flooring options, as it is made of natural materials that are highly renewable. Linoleum is also recyclable. When it comes to keeping your linoleum kitchen flooring clean, regular maintenance is very simple. The floors can be swept, vacuumed and mopped regularly. However, you will want to use a natural cleaner on your linoleum floors, as harsher chemicals can damage the linoleum. Also, while it is water resistant, linoleum is not fully water proof, so you will want to mop up spills as soon as they happen and avoid soaking the floors. Making repairs in your linoleum is easy in comparison to vinyl or hardwood: simply fill any gashes with a mix of wood glue and saw dust and paint to match the existing flooring! Because linoleum sheets have to be carefully cut and glued, sheet linoleum flooring should be installed by a professional. This can be somewhat costly, and finding a reputable installer who is not fully booked a year in advance can be difficult in some areas. You can install linoleum tiles on your own, however. You simply spread the latex adhesive on the underlayment with a trowel and lay tiles snug against one another. The tiles will need to be cut to size using a specialized tool, however. Some companies now offer a click panel style for linoleum flooring, as well, making installation a breeze for anyone. A plywood underlayment is usually best for linoleum, though it can be installed over other surfaces in some instances. Linoleum has been known to fade or yellow when exposed to UV light over time. 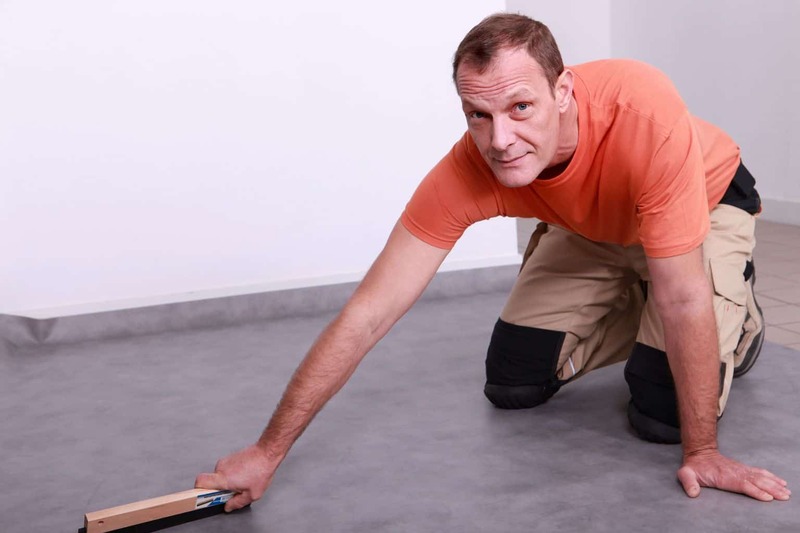 To combat the fading and because linoleum is naturally porous, it is recommended that you reapply one or two coats of an acrylic sealer to the flooring annually. This amount of upkeep is a turn off for some people, though the application process of the sealer is fairly simple. The kitchen flooring in this old farm house is 6 inch square tiles laid circa 1956. I think they are linoleum; marbled colors are still vibrant & run through the thickness of the tile. They are warped at some edges & will have to be replaced. How do I learn whether they contain asbestos? I presume it will be best to remove the tile before laying new flooring. Please advise. Actually, I would recommend that you not remove the tile before laying the new flooring overtop. In all likelihood, your floors do contain asbestos, and leaving the asbestos alone is the easier way to go. The asbestos is dangerous when you start pulling it up and the particles are released into the air. This will also go over how you can test for asbestos and more details on why I think covering the existing flooring is the way to go.